Squab is a general culinary term for young domesticated pigeon. Before current practice of raising one type of pigeon for meat consumption, doves, mourning doves, and the now-extinct passenger pigeon had also been included as squab. Squab has been raised as livestock for hundreds of years, possibly originating in the Middle East, but there are historical records citing squab-raising in Ancient Egypt, Rome and extensively throughout the Medieval period in Europe. Squab has long been considered a delicacy (it was served on the Titanic), but because pigeons are easy to raise and breed, it is also eaten in lower-income areas. Despite the popularity of squab and pigeon in many cultures, it is often considered unsanitary, due to the misconception that squab is the meat of feral pigeons. Squab have been raised in the U.S. and Canada since 1900. Formerly, pigeons were raised in dovecotes, which allowed the pigeons free access. Pigeons differ from other poultry in that males and females bond exclusively (once mated, they breed a number of years), and both parents brood (thus eliminating the need for incubators) and feed the squab chicks, which promotes fast growth. Increased production of squab is achieved through "double-nesting," which allows the female pigeon to lay eggs in one nest, and when the chicks hatch and are about 2-weeks-old, she moves to a second nest while the male broods the chicks. This procedure yields twice as many squabs. What Does Squab Taste Like? Squab is a tender and moist dark meat. It has a slight game flavor, similar to duck. In commercially raised squab, there is more breast meat than leg meat; however, traditionally raised squab have a more equal proportion. Although there is a layer of fat on squab, the meat itself is not fatty or greasy as duck or goose. Squab is very popular in many world cuisines. 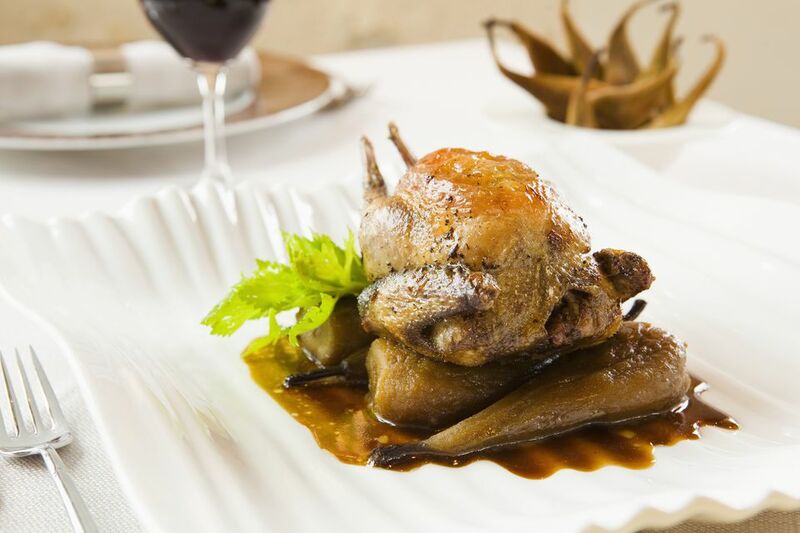 In Asia, squab is prepared similarly to Peking duck with crisped skin and moist flesh. In France, squab is often prepared roasted or as confit, and older birds are braised in casseroles. In Indonesian cuisine, squab is deep-fried and spiced with chilis, and in Egypt, it is grilled or stuffed with rice and/or herbs and roasted. Squab differs from other game birds in that it can be cooked rare (in France, "bloody to the bone"), medium rare (rosy pink), medium and well-done. Where Can I Buy Squab?